An acting police chief who assaulted a female journalist in the Moscow suburb of Moskovsky has been fired following media reports about the incident, RIA Novosti reports. “Following the assertion all circumstances by the administration of the Moscow Regional Main Department of Internal Affairs, a decision was made to fire the officer in question from internal affairs,” Golovkin explained. “The question is being decided on whether to file criminal charges and transfer materials to the Investigative Committee of the Moscow Regional Main Investigative Department of the Russian Federation to make a lawful decision.” He added that the order to fire Klimov was signed on April 4. As Seybil told Ekho Moskvy radio on April 3, the attack came after a car pulled up to her building while she was outside walking her dog. 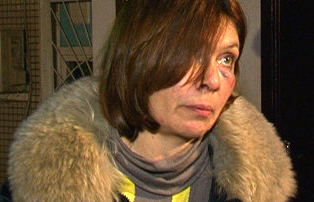 The driver – Klimov – attempted to flirt with her and asked for her name, but the journalist brushed him off. “I said: ‘Excuse me,’ – and kept walking. He began asking me again and I said ‘Vasya’ – and kept walking,” said Seybil. After that, the man jumped out of the car, grabbed her hair and punched her in the face. At that point, Klimov flaunted his identification as a criminal investigative officer. According to Seybil, the police officers who arrived on the scene released Klimov, saying that there was nothing they could do: “This is our chief,” they told her. “I’ve been assaulted – my face has been punched, there are bruises all over my body and I had a hypertensive crisis,” Seybil told reporters. Colonel Yevgeny Gildeyev, a communications officer with the Moscow regional police department, issued an apology to the journalist. “On behalf of the administration of the Main Department of Internal Affairs, I extend sincere apologies to Natalya Seybil. I hope that nothing like this ever happens again; indeed, only true professionals should be police officers,” he said. Russia’s federal Investigative Committee says it is looking into the case. Seybil has worked as the editor-in-chief of the talk show Pust Govoryat (“Let Them Talk”) on Russia’s state-controlled Channel One, as well as for the programs Gordon Quixote and Zakryty Pokaz (“Private Screening”).